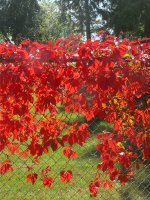 Virginia Creeper is a fast-growing, climbing vine. Its root-like tendrils attach themselves to any non-smooth surface, even brick, but will also grow as a ground cover. Virginia Creeper makes a beautiful ornamental plant for your garden; its attractive foliage turns from green to deep red in the fall. Birds will love its red berries. Amur Maackia is a robust and pretty tree often used for urban decoration and landscaping. This tree has coppery peeling bark that can sometimes resemble lace. Its upright clusters of small white flowers usually bloom in midsummer. Amur Maackia's Small size makes it a great choice for small yards or limited space.